If you are like me, you are just about finished buying all the various snakes you plan on giving out as Christmas gifts this weekend. You have rounded out your assortment of garter snakes, copperheads, King Cobras and rattlesnakes and finally are sitting down to wrap them all. You know that your kids, grandmother, Great Aunt Ethel, cousin Bill and the newest addition to the family, 3-year-old Molly, would be sorely disappointed to open a package and finding anything less than a live and well snake. It crossed your mind once to tranquilize the sucker and give it to them all limp and lifeless, but then they would think it was dead on Christmas morning! Who wants a dead snake? NO ONE! So, that is why I have decided to come to your rescue with tips on how to gift wrap a snake. Before we go any further, I truly cannot take all of the credit for these ideas. As I wrestled a python so I could slap a big red bow on his head just yesterday, I was getting quite frustrated and turned to my personal Facebook page for help. 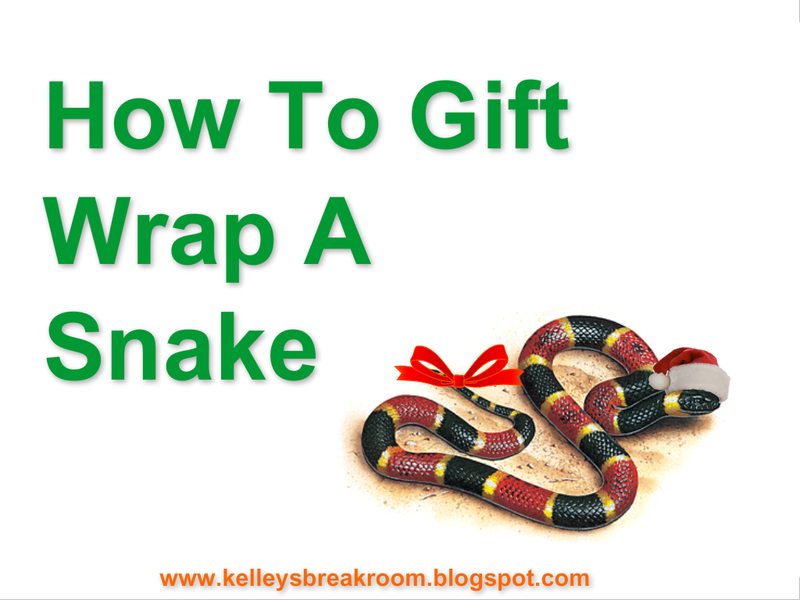 Many clever people had good ideas on how to gift wrap a snake to perfection. You’ll see those smart contributors’ name with each idea. The issue here isn’t the exposed head of a poisonous snake. The issue is that, DUH, they’ll see what they’re getting for Christmas before they open it up! Christmas is about surprises and there is no surprise here. (Also, during our gift wrapping trials, he kept slithering out of the dingdang tube.) My friend, Aimee, suggested stuffing the snake inside it and then wrapping the ends with ribbon so that it resembles a giant Tootsie Roll. A snake-stuffed Tootsie Roll! Can you think of anything more pleasant than that?? This is a great idea, because you can just mix the tiny snake in with food that you have prepared for the Christmas feast or food that you want to share with a friend. At first, they won’t even know a snake is in there! Hahaha!! They’ll reach their hand inside and, BAM, they’ll know instantly that something in there has teeth. The last time they checked, it sure wasn’t the green beans! So, yeah, this offers an element of surprise and, as Courtney from Just Plain Jayne mentioned on Facebook, guaranteed freshness! Eliza suggests not evey worrying about “gift wrapping” the snake, but covering it with glue and then sprinkling it with glitter. Really, this is an efficient way and festive way of presenting your gift. As before, they’ll defnitely know what the gift is once they see his black slippery tongue, but they would find out soon enough anyways, right?? I love that the glitter is matched with the King Rattlesnake here. He is ready to party! Actually, I insist that if you give the rattlesnake, you go with this gift wrap option. Adrian said that if you just show the snake a picture of Rosie or Whoopi, he’ll immediately lose the will to fight and you can essentially wrap him in anything. If you are more of a cute wrapping paper person or you just love gift bags with lots of tissue paper, this may be the way to go this Christmas. This method can also be used to place the snake in a stocking, though it would have to be a rather large stocking to fit this python, amirite? Thanks, Adrian, for that tip! Back to gift-wrapping…as you can plainly see, there really are so many different ways to gift wrap a snake. You need not be worried over how to present this perfect gift to your loved ones this year. Now, go get you some eggnog and relax!